Successfully Added Waterproof LCD Monitor + Remote System - NTSC to your Shopping Cart. Waterproof LCD Monitor + Remote System - NTSC. Waterproof 8 Inch TFT LCD screen bundled with a waterproof remote. 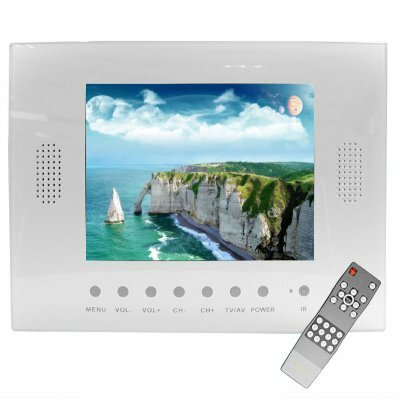 This waterproof system comes with VGA and AV (Audio/Video) input for putting almost any kind of media that you want on this crystal clear screen. Simply install this waterproof screen anywhere you would not normally have a monitor due to water, and enjoy watching movies or TV like you never thought you could. Chinavasion offers this great accessory for high end bathrooms, saunas, bars and boats at an unbelievable low wholesale price and our famous one year warranty. Waterproof LCD display and remote. For bathrooms, locker rooms, etc. Has input ports for AV and computer connections. The TV receiver in this product is for the NTSC color system. If you need a unit for the PAL color system then please order CVEWP-TW808B-PAL.